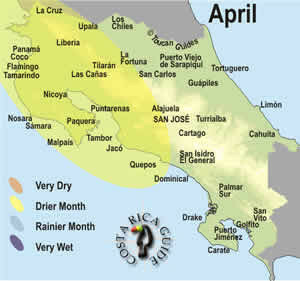 Costa Rica April rainfall patterns. April is the heart of the dry season and one of the best months to travel in Costa Rica. or see when to travel? Our favorite time to travel is when it’s cold up north and many of our “Best Trips Ever” were in the first part of the year. The tropical beaches are a sure cure for cabin fever! April is the end of the Costa Rican dry season. The western and central regions of Costa Rica have nearly no rain and mostly sunny weather. What little rain falls usually comes as afternoon or evening showers and most people are surprised to find that Nicoya and Guanacaste are more reminiscent of the Arizona desert than a jungle. March and April are the hottest time of year especially in the western half of Costa Rica. Sun worshipers revel in highs around 86 to 96 °F (30-37 °C) followed by overnight average temperatures of 78 to 86 °F (26-30 °C) with no rain to break the cycle. The Costa Rica Time Machine matches the best destinations with your travel times or the reverse. Generally April is a drier month but the southern Pacific (starting south of Jacó) and the Caribbean lowlands are wetter climates and the residents there start looking for some relief from the heat around this time. The forests there are true evergreen rain forest but sometimes even they start to wilt before the rains come. This one of the most popular months for Costa Rica travel. It’s the heart of the high season for international travelers. Activities and accommodations fill up very quickly. Advanced reservations (as far ahead as one year ahead for popular beaches) are strongly advised around Easter (April 21 in 2019). January through April of 2018 were the busiest we’ve ever seen in Costa Rica and it looks 2019 is following suit. The hurricanes in the Caribbean Islands in September 2017 destroyed many beaches and resorts causing increased demand in Costa Rica. Lodges, boutique hotels and resorts are selling out earlier than usual and it looks like 2019 is shaping up to be a record year. Normally we say winging it and just showing up at your next destination without reservations is possible in April but it’s going to be tight… arrive early in the day to start looking, stay flexible in your expectations, and unless you’re really adventurous avoid the holiday week. If you don’t want to be disappointed and end up miles from the beach make some reservations on your own or with a qualified travel planner who may have expanded availability compared to online booking sites. April starts out as one of the most popular months for international and domestic travelers and local Easter holidays (April 21, 2019) push demand (and prices) even higher. Peak season rates for the best hotels and lodges are often 30-50% higher than normal high season rates and can be more than double the low season rates. Availability is limited and can be further complicated by 3-4 night minimum stays around the holiday so we recommend reservations at least two months in advance – six months or more ahead of time for the best selection. Discount airfares are hard to come by in April and the sales usually happen early. Try to plan ahead at least two months and set a “fare watcher” for your dates on your favorite ticket search sites to get the best airfare. In 2019 Easter falls on April 21st but you can enjoy the same great weather but avoid the crowds by traveling in February or early March. NOAA expects the mild El Niño Southern Oscillation pattern to persist into April of 2019 which means slightly less rain than average on the Pacific side and in the mountains but possibly slightly more on the Caribbean. Costa Rica was not affected by the hurricanes that devastated the Caribbean Islands in September of 2017 and has seen a surge in reservations in the past two years. Book soon. approximate exchange rate ¢611 per $U.S.